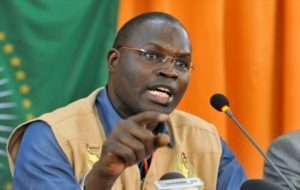 Senegal’s jailed former mayor of capital Dakar, Khalifa Sall, plans to run for president in February 2019, Reuters reported on Friday. Khalifa Sall, mayor of the capital Dakar, was sentenced to five years in prison for embezzling $3.4 million, charges that the 62-year-old politician had denied. His conviction bars him from next year’s elections, where he was predicted to present a strong challenge to President Macky Sall. Khalifa Sall claimed his trial was politically motivated, following his refusal to cut deals with the government. “Yes I am a candidate for the presidential elections on February 24, 2019,” Sall said in an email to supporters on Thursday. Senegal is one of the most stable democracies in West Africa. The country is the only country on mainland West Africa never to have had a military coup. It has seen two peaceful transfers of power following elections, most recently in 2012, when Macky Sall became president. A dissident member of the Socialist Party, Khalifa Sall began his political activism at the age of 11. After holding various ministerial portfolios under then Socialist President Abdou Diouf, he was elected mayor of the capital in 2009. Posted by Khalid Al Mouahidi on July 27, 2018. Filed under News. You can follow any responses to this entry through the RSS 2.0. Both comments and pings are currently closed.